This weekend I will once again be exhibiting with Faire Trimmings in the Artist’s Colony of Connecticon 2013. Held at the Connecticon Convention Center in Hartford, CT, Connecticon is already in its 10th year! The artist’s colony is located on the first floor, in the same giant exhibition hall as the dealer’s room. There will be large crowds of people flocking to it, so really you can’t miss it. I will be in booth AC-37, which to my understanding is right next to the information booth near a major isle. That should make us pretty easy to find. We will be selling one-of-a-kind costume accessories made from leather, fabric, feathers, and more. There will be jewelry, masks, and prints to sift through. If you’re a fan of steampunk, cosplay, crafting, or period clothing you should come check us out! Artist’s colony will be open Friday 12-8pm, Saturday 11-7pm, and Sunday 10-4pm. Kelley and I will spend the weekend at our booth in costume. So come by to take a picture or to say hello! My cosplay group “Meta Cosplay” has a brand new facebook page. We have been cosplaying together for several years and have finally gotten around to making an official fan page on Facebook. 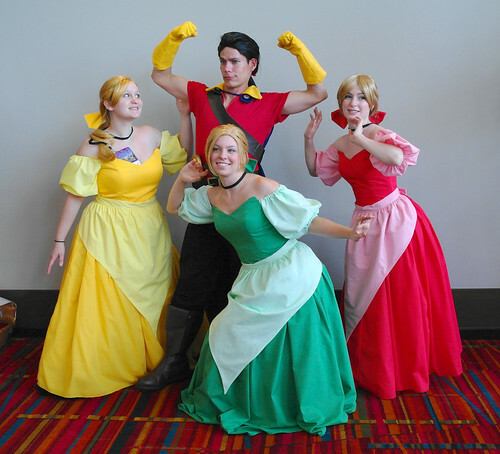 You have seen the group’s work featured here on this blog several times already cosplaying from the X-Men, Howl’s Moving Castle, and Beauty & The Beast.